University of Wyoming students Kaci O'Grady, left, and Sydney Jones are providing energy and financial information to help the university receive rebates for converting to more efficient lighting in campus buildings. A pair of University of Wyoming students are mapping the lighting in several older campus buildings in a project that will make UW more energy efficient. 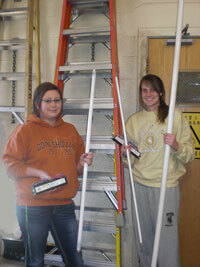 Sydney Jones, of Sugarland, Texas, a junior in zoology; and Kaci O'Grady, of Wheatland, a junior in agricultural business, are developing a detailed inventory of the lights in each building to allow UW to qualify for rebates offered by Rocky Mountain Power. The work is the students' learning project in the Campus Sustainability course offered through the Haub School of Environment and Natural Resources. They are working with Frosty Selmer, deputy director of utilities management with the UW Physical Plant, to replace T-12 fluorescent lighting with more energy-efficient options. "The energy and financial information they provide will aid the university Physical Plant in acquiring rebates from Rocky Mountain Power while helping the university become a more sustainable institution," Selmer says. "It will have implications both on campus and in the community, and could serve as an example for other Albany County businesses to become more sustainable." He says the amount of the rebate will be lower after July 14. "The rebate incentive to replace T-12 bulbs with lower-wattage lights becomes even more attractive with the production of T-12's ending on July 1," Selmer says. "This means that as T-12 lights burn out, they will eventually need to be replaced with lower-wattage bulbs because of a lack of alternative options."